People love to come to Asia to do things they love: Travel and shop. Asia with all its splendor, tradition, and foods are usually the drawing point for curious travelers from across the world. Of course, when traveling to Asia, travelers hit the local markets to get the best deals and bargains, right? Places such as Hong Kong, Taipei, Tokyo, Shang Hai and Singapore are the top places access shopping nirvana, however, never leave out Bangkok. The country is well known for its shopping districts, especially when it comes to local markets on sidewalks or designated locations. Where are the best places to shop in Bangkok? Here’s a few places to keep in mind when finding the ultimate shopper’s paradise in the city. Everybody knows about the famous Jatujak weekend market located at Jatujak MRT station. 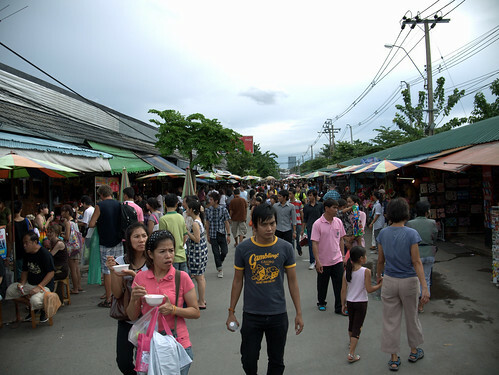 Jatujak market is Bangkok’s largest open market, open every Saturday and Sunday (and some national holidays). The market has a plethora of things you can purchase: Souvenirs, clothing, food, electronics, gifts, books, plants and even animals. Whatever you’re looking for, Jatujak market has it! It’s extremely rare to see JJ market empty as most alleys (particularly in souvenirs, clothing and pets) are packed with people. For those who aren’t too comfortable with congested alleyways, avoid JJ market. JJ market opens from 9 AM to 7 PM. Not a lot of people know about this market due to its far off location. It’s pretty far from downtown, located around Thonburi area, close to Thonburi University. Considered the second largest market in Bangkok, Sanam Luang 2 may not be as big and busy as JJ but it certainly has clothes, plants, food and clothing for those who are interested in casually walking around the place. Not a lot of haggling is done here since everything is fixed prices. It’s a nice area to go to if you’re not too keen on the crowds which fill alleyways like JJ market. This market here is more relaxed. Next to the market is a large park where people can freely enter and relax by a small lake. Sanam Luang 2 is open every day from 9 AM to 5 PM. This is one of the best places if you’re looking for cheap clothes. Platinum Mall is a mall located around Pratunam, which in itself is another mega shopping area with tons of stalls opening up at night. Platinum Mall is packed with people in search for good deals on clothing. A lot of locals come here to purchase work clothes and accessories. What’s special about Platinum Mall is the mall contains clothing for plus sized and petite individuals so nobody feels left out. Men can get their suits tailored here and women and buy a myriad of clothes for work. However, keep in mind that Platinum Mall has a strict ‘No Fitting’ rule. You can’t try on the clothes before you buy them but you can return them if they don’t fit. The accessories section is located on the fourth and fifth floor of the building which range from gold plated, silver plated to cooper carved accessories. One of the key points about Platinum Mall is that things have to be bought in bulk to receive a discounted price. Sellers would not settle on discounting one particular item but rather, discount it as a whole. So don’t be surprised if you see people dragging along large shopping bags! That’s the bulk they purchased stuffed in those bags! MBK or Mahboonkrong is another shopping hotspot, located at National Stadium BTS. This 6 story high, massive building houses everything you need to buy in Bangkok (and Thailand). This department store allows you to haggle. Yes, you can haggle with stores for the best price that suits your wallet. If you’re exhausted, you can take advantage of the small spa and massage stalls scattered around MBK for a price. Although this place isn’t about bargains, Terminal 21 is a high-end shopping mall located at Asoke, attached to BTS and MRT. What distinguishes Terminal 21 from the rest of the mall is the mall’s creativity in expressing every floor as a different country. This high-end mall contains a lot of well-known names as well as nice stalls selling souvenirs, indie-styled jewelry, shoes, bags—you name it, Terminal 21 will probably have it. Of course, the price may bite a big hole out of your wallet!